Most people have dealt with some kind of wart at one point or another. Today I want to tell you how we effectively got rid of warts easily and pain-free. After trying several methods, including diluted Oregano Oil, we found these homeopathic tablets on Amazon and gave them a try. Within 10 days the warts were gone! How they work is Thuja, which is a type of tree found in Canada that has antiviral properties, works to stimulate the immune system to kill the virus that causes the wart. Another nice thing about these homeopathic tablets it that they are sweet so children gladly remember to take them! For adults you dissolve 5 tablets under your tongue 3 times a day, for children, it’s 2-3 depending on their size. Also, I recommend taking another tube after the wart is gone, to decrease the chance of it popping up again somewhere else. When I was a kid, my dad, who is very creative, was always coming up with new inventions. One of his best ones was hangings swings or bars in our house for us girls to swing on. We spent hours of our day swinging, hanging, and playing on these bars. We had better upper body strength than any kid our age and we spent considerably less time watching t.v. Now that I have kids of my own I wanted to give them that same gift, so I asked my dad to come over to help hang our first swings. First, we bought ski handle bars, chain, eye hooks, and carabiners. Then we found the center of our studs on the ceiling, drilled the holes, and screwed in the eye hooks. They are very secure and the kids spend hours a day on them. On a side note, we do replace the carabiners about once a year because they start wearing thin. 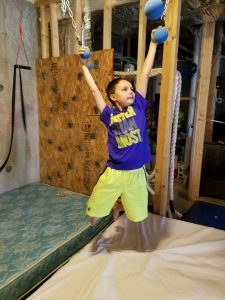 In our basement, we also have Olympic rings and cannon balls (think America Ninja Warrior) to change things up and help with their grip strength. 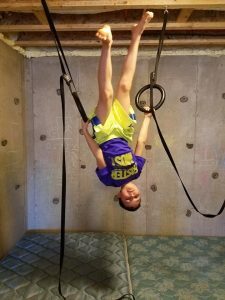 The kids love swinging from bar to bar, hanging upside down, and acting like wild monkeys! 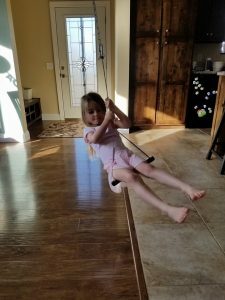 The swings are great for so many things including their core strength, grip strength, dexterity, fine motor skills, and to get energy out! They are also great for adults to work out and play on too! 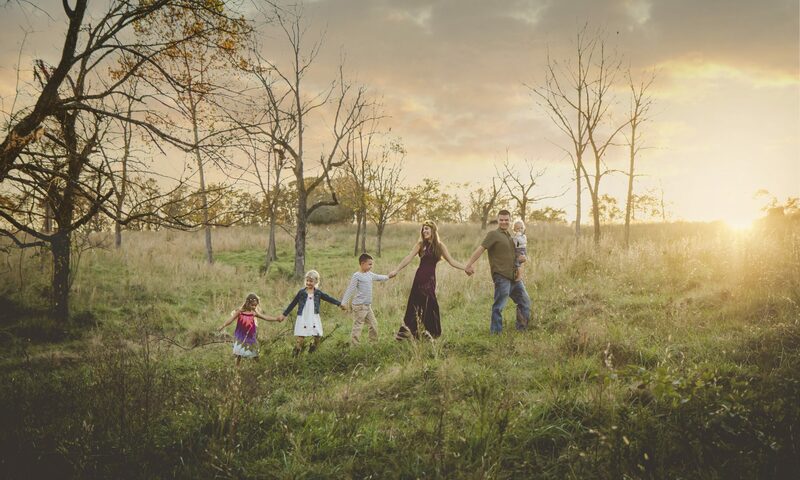 Here are a couple of photos of my children using them and the set up we have. 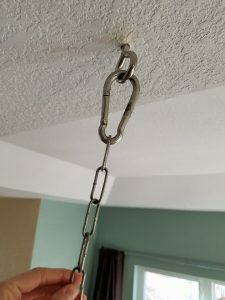 The eye hook in the ceiling and the carabiner attaching the chain to it. The chain makes it easy to adjust the height of the swing. Evan hanging upside down from the Olympic rings. 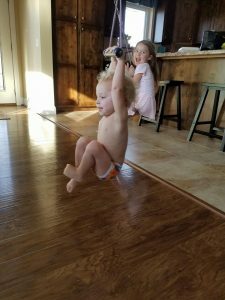 Emmett (who just turned 2) loves to swing too! Bella likes the swings to be lower so she can sit and swing. Evan going across “Cannon Ball Alley”. It’s amazing watching him progress and get stronger!